In keeping with our tradition of creating innovative styles and using Old World woodworking methods, Brandenberry Amish Furniture presents a new children’s furniture collection: the Louis Phillippe Children’s Furniture Collection. Featuring durable craftsmanship, a variety of wood and stain options, a spacious design and a timeless style, the Louis Phillippe Children’s collection is truly special. For parents searching for high-quality children’s furniture that is safe, comfortable, durable and stylish, look no further than this collection. 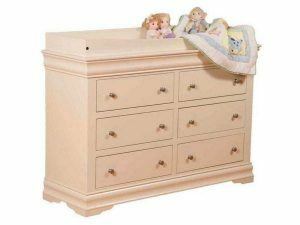 Check out the Louis Phillippe Children’s Dresser (pictured below) for more information! An elegant finish accents the Louis Phillippe Children’s Dresser.